To be seen and not heard, is certainly not part of the upbringing of these feisty chatterboxes. As soon as you near, they are sure to alert you of their presence – perhaps by launching into a melodious cascade of sounds to rival a nightingale – or going on in a rush of inflections as if to fill you in on the gossip and stories of the neighborhood – or will let you know it’s annoyed with a scolding whine reminiscent of a demanding cat. 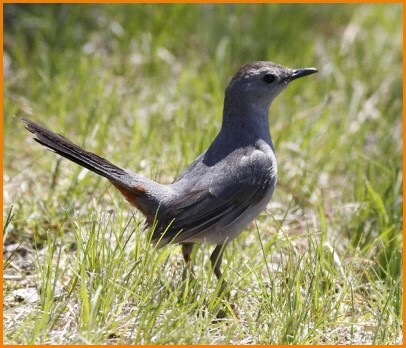 Like the Thrashers and Mockingbirds, the Catbird is a mimic, with exceptional ability to reproduce the calls of other birds and sounds from their surroundings. Their special voice box can even make two sounds at the same time! Males sing their most impressive songs in the spring, lasting up to ten minutes, but can continue to surprise us with unexpected sounds and mimicry at any time of the year. They love scrubby brush, filled with arthropods and fruit, making Nantucket a perfect place for them to raise their families. They usually arrive in May to set up house, laying eggs are as colorful as their personalities — a vivid turquoise. While some will stay all here all winter, many will leave in the fall, heading southward from the Gulf Coast to as far as Panama and the West Indies! Appearing solid gray at first glance, a closer look reveals the rakish black cap and rusty patch below the tail, more suited to their flamboyant personality. 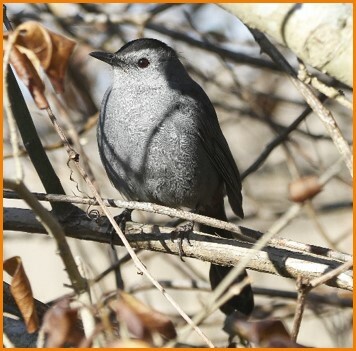 This entry was posted in What's New In Nature and tagged catbird, Dumetella caroliniensis, grey catbird, Nantucket, Nantucket Conservation Foundation, NCF, what's new in nature. Bookmark the permalink.